Since its foundation in 2002, Erik has been strongly involved in the International Software Testing Qualifications Board (ISTQB). From 2005 till 2009 he was the vice-president of the ISTQB organization and he is the founder of the local Belgium and The Netherlands board; the Belgium Netherlands Testing Qualifications Board (BNTQB). Today, he is the president of the Curaçao Testing Qualifications Board (CTQB). 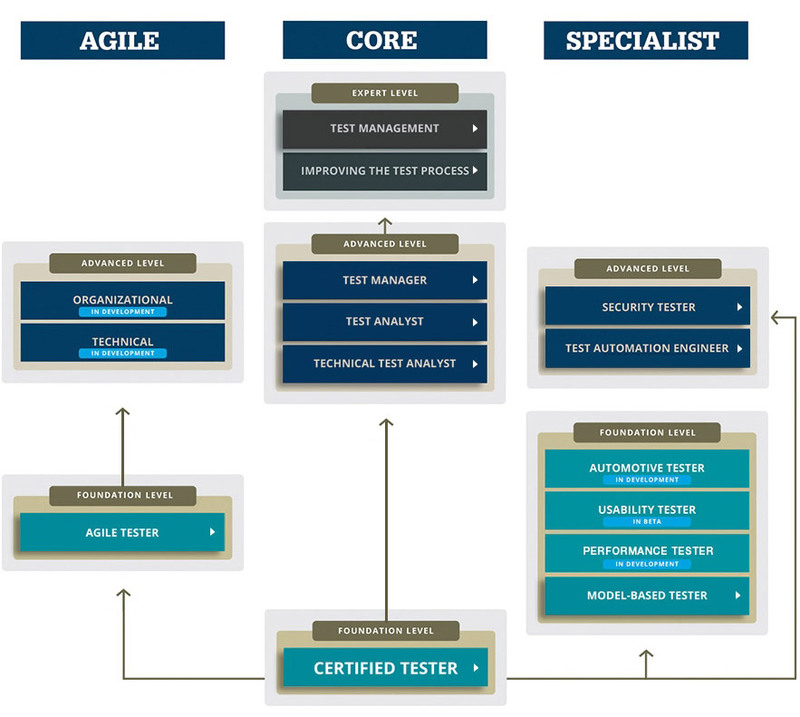 The evolutionary road-map for the ISTQB Product Portfolio is summarized in the picture below. ISTQB will of course continue with existing Foundation, Advanced and Expert modules. These are grouped under the Core stream. Modules that are more specific in their nature, are served under the Specialist stream. Agile methodology related syllabi are grouped under a dedicated Agile stream. From its inception until 2014 Erik was the editor of the ISTQB “Standard Glossary of terms used in Software Testing”. As a working party chair, he has lead of the ISTQB Expert Level working party for over 10 years. As a co-author he is also involved in writing syllabi at Foundation, Advanced and Expert level. In March 2010 Erik received a “Certificate of Appreciation” for his continuous contribution to the ISTQB mission and organization. Erik has run many ISTQB courses, at both Foundation and Advanced level, and also in the Agile stream. His courses are characterized by high participant satisfaction scores and high pass rates. Hereafter you will find an overview of the most important ISTQB deliverables, many of which Erik contributed to. To support the ISTQB Foundation level, the book “ISTQB Foundations in Software Testing” has been published. It has been written by the international testing experts Dorothy Graham, Erik van Veenendaal and Rex Black. Erik has written “The Testing Practitioner” to support the ISEB Practitioner certificate, the predecessor of ISTQB Advanced. This book is still highly useful as supporting literature and has even been accredited as part of the ISTQB Advanced training material of Improve Quality Services. To support the ISTQB Expert level Improving the Testing Process, the book “Improving the Test Process” has been published. It has been written by Erik together with Graham Bart (together also the authors of the ISTQB syllabus).